Invite a child to come by telling them you have something to show them. Have the child bring the tray and have them bring it over to the table. Have the child set it on a specific spot on the table you will be working at and tell the child where to place the tray. Have the child sit down first, and then you sit down to the child’s right. Tell the child that you will be showing him how spoon grain. Give the names of each object. Pinch the handle in the middle of its length with your right thumb on top and your right index finger wrapped under. Lift the spoon off the tray. Wrap your three right fingers around the handle and firmly grip the handle. Lift the spoon over the middle of the right bowl that is full of grain. Rotate the oval mouth of the spoon down by slightly rotating it toward you. Place the back of the spoon near the far side of the bowl. Slide it down so it goes under the grains. Scoop the spoon toward your body. Rotate the spoon so it is back in the flat position. Lift the spoon up out of the bowl carefully. Lift the spoon so it is above the top of the bowl. Move the spoon in a slow but smooth way so it is over the middle of the left bowl. Rotate the oval mouth of the spoon slowly toward your body so the grains slowly pour into the mouth of the bowl. Once all the grain has slid off the spoon, rotate the spoon back into the flat position. Bring the spoon back over to the middle of the right bowl and repeat scooping and pouring movements until all of the grains are in the left bowl. Repeat the same movements for scooping the grains from the left bowl into the right bowl. Bring the spoon over its original spot. Lower the spoon and place the oval mouth down on the tray. Unwrap your four right fingers from the handle. Place the handle down on the tray. Remove your right index finger and then your right thumb. 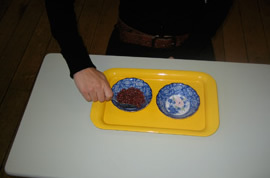 If grains have fallen on the tray, remove the left bowl by place your right hand around the right side of the bowl and your left hand on the left side around the bowl, lifting it up and placing it on the table above the tray. 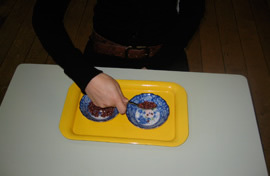 Remove the right bowl in the same manner and then the spoon by picking it up in the same way as above. 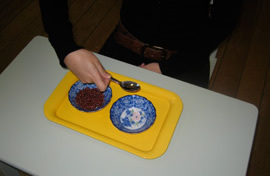 Using your right index finger and thumb, pinch one grain at a time and replace in the bowl on the right. Replace the spoon and then the right bowl and left bowl back on the tray. Offer the child the opportunity of scooping grain. Once done, have the child replace the tray in its spot. Direct: To develop the skill of spooning. Indirect: Coordination of the child’s movements and development of concentration. Positioning the oval mouth of the spoon in the center of the bowl, so the grains fall into the bowl and not onto the tray. This Montessori Video shows how to present a child with spooning grains.